Mom. Dietitian. Food Lover. I find joy in helping others relieve the stress of meal times and feeding their children. I hope you take the time to peruse the blog for some helpful tips and tricks, and follow me on social media for even more! Setting up a feeding schedule for toddlers is one of the best ways parents can prevent feeding issues down the road. It can also save your sanity in the meantime. Read on for the details! As babies turn into toddlers, it can sometimes seem like your sweet little baby has disappeared into a demanding, irrational little human. Your baby has now realized that they are their own person and can say no to something. They no longer do what you want just because you ask them to! Feeding struggles are no exception to this change. Whether it’s deciding to be “picky” and not wanting to eat something that you know they’ve liked before, or wanting to graze on snacks throughout the day, it can drive a parent batty. Whether you have felt the sting of this attitude change already, or haven’t seen it yet, there is one thing that you should implement right now to help you and your toddler get through this stage. If you let them, the average toddler would snack constantly throughout the day and only eat foods that are easy to like- think goldfish and cheese. And while there’s nothing wrong with those foods, they definitely aren’t nutritionally sufficient to provide everything that your child needs to keep growing. The best way to start solving this problem is to implement a feeding schedule for your toddler. Set times throughout the day when they are going to eat. 3 meals and 2 snacks is the usual recommendation, but every baby and family is going to be different and might need something slightly different than that. Usually you want to keep meal and snack times no more than 2-3 hours apart, as your toddler’s tummy isn’t big enough to go much longer than that during the day. This can involve some trial and error when it comes to naps and going out. 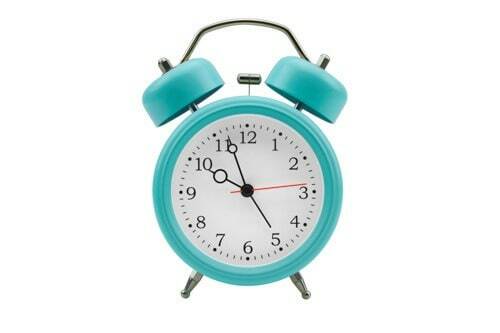 You don’t need to be 100% rigid in sticking to the schedule, but you do want to be pretty close. When you implement a feeding schedule, you are providing structure for your toddler, something that they desperately need at this age. They know that there will be food again soon. There’s no need to beg for a snack, and they don’t need to guess if there will be food soon or after several more hours. By setting up a schedule you allow food to be moved from the front of their mind where they constantly worry about it, to something that is predictable and can then be forgotten about for awhile. Setting a feeding schedule gives you an answer when your toddler begs for food. “It’s not time for a snack yet, we’ll have one in 30 minutes” will become a common phrase at first. That’s not a bad thing! It might get old for you, but eventually they will learn to wait for snacks and meals, and that they come at predictable times of the day. A schedule also gives you a reason to help them learn to deal with their emotions with something other than food. Yes, food is an easy answer. But by giving food every time something goes wrong or they feel an emotion, we can teach them that food is the way to handle being sad, or anxious, or bored, or any other number of things. We all want to help our kids grow up to be healthy adults, and a great way to do this is to teach them when they truly feel the need for food, and when food will not satisfy the emotions that they are feeling. Having a schedule can help to guide us in doing this. By implementing a feeding schedule, you are helping your toddler to learn to tune into their hunger and their fullness cues. It isn’t a bad thing for them to experience hunger for a little while. We’re not talking true hunger, admittedly, we’re talking that feeling when you start to need a meal or snack to satisfy it. There is another meal or snack coming soon, and you know that they will not starve by going another hour without food. If your toddler is grazing, they never learn what the feeling of hunger is, and they can learn to override their body’s cues for hunger and satiety. Down the road, this can lead to constant snacking and overeating as an adult. It is tempting to let your toddler eat whenever they want, especially if they normally don’t eat much. But it can actually have the opposite effect from what you want, and toddlers often eat fewer calories over the course of a day with grazing. By implementing a feeding schedule, you are allowing them to get hungry enough to actually be interested in the nourishing meals and snacks you provide. You are teaching them that that first pang of what they think is hunger doesn’t need to be immediately satisfied. They can wait a little bit until they truly experience a hunger that is satisfied by a nourishing meal. And one that isn’t just a bite or two on the run! 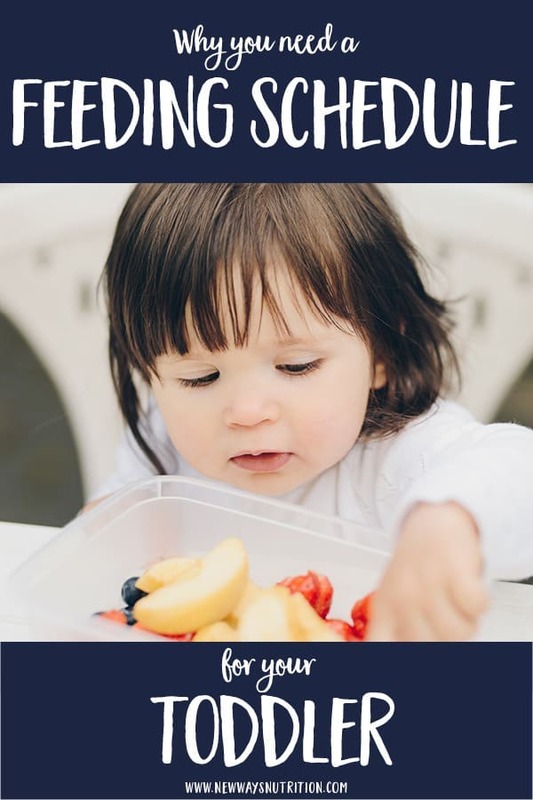 Setting a feeding schedule also means that you don’t have to have small snacks constantly on hand to graze on while they’re in the stroller or at an activity. If you will be out at a snack or meal time, you bring a full, balanced meal or snack that will keep your toddler satisfied for awhile. You stop and have your meal and snack. And then you move on with your day. There’s no running up to you for constant snacks. No meltdowns in the stroller that are only solved with food. You have a schedule, even when you’re out, and it gives them much needed predictability that takes the focus off of food. I recommend eating about every 2 to 3 hours. This usually means dividing your day with the three main meals, and then fitting snacks in between. But what your own toddler needs will be determined through trial and error on your part. There is no ideal schedule to emulate. The best one is the one that works for your toddler and your family. It can be quite the juggling act to get meals and snacks served between activities and naps and everything else that goes on in a day. The goal is to set a general schedule, but if something goes wrong one day, it is by no means a dealbreaker! Just get back to your schedule when you can, and make that the general goal for your family. Previous Post How to Cut Foods for Baby Led Weaning Next Post What is Baby Led Weaning, and Why Does it Get a Bad Rap? Very good info! I was actually hoping to see something about baby eating schedule. My daughter is 6mo and just started eating solids. I am wondering what the schedule should look like. Liquid feeding first, then solids, or the other way around? I am just s little confused on how the schedule should look like.